I was going to do this ages ago, I've finally remembered to do it while I'm online. As you see there are only a few here at the moment, you are more than welcome to add yours, also if you want to add your name/user name next to your angel/s then go ahead, just cut and paste the info into a new message. Last edited by TrinityClair on Sat Jun 09, 2007 12:04 pm, edited 1 time in total. Oh Tanya, I am in tears here also, what a beautiful tributet to your gorgeous son. I am like you Amanda, reading the story hoping for a different ending, but knowing what the outcome was. Thanks so much for sharing Liam with us. I have met Hillary at the SANDS conference, and have also been into the nurses chapel that Liam's service was at, so sort of could relate to how the service was. It is a beautiful little chapel. Oh Tanya ... my heart goes out to you and your family. I too was the same reading Liam's story yet hoping for a different outcome. I know too what you mean about making the memorial page being great therapy, I felt the same way doing Julia's one. I have tears pouring down my face, I can not stop them no matter how hard I try cause they keep flowing. My journey through the Neonatal units giving me way to much knowledge of your journal and your journey and just what the medications and everything mean. Knowing the ending I was still on edge reading your daily entries. Lisa - I have just read the story on your website (with a huge amount of tears ) and it was scary how similar many things were to my story. I think you are the first person that I have come across on this site that had a little bit of time with their baby before they grew wings - a time that we will treasure forever! Big Hugs!! Ok now I am bawling. Calypso is so beautiful , My tears are not just for her passing but for the journey that she had while she was here, the fight that she put up. Seeing her so odemas ...too many memories of my years through the NICU'S. 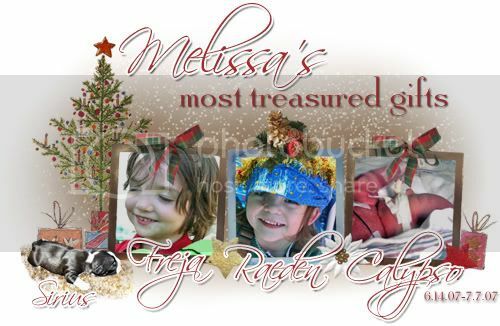 Melissa, You have done such a wonderful job of her site. I am in shock that they actually told you that at all. Well I requested and paid for her entire medical history from birth until death. So they HAD to tell me. It was in the paperwork. Her paper work invludes EVERYTHING she went through in her life including what time she was taken off the vent and what time she passed away. I haven't been able to read everything. I only read what happened on the day she died. Her left lung collapsed on the morning of July 7th because of all the fluid. That coupled with the kidney failure. They gave us the option of putting a tube into her chest and trying to drain the fluid but the day before I'd sat there singing her our lullaby and told God I didn't want her to hurt anymore and if she got worse to let her go to Heaven. So we let her go.